Candied orange peel are delicious, but with chocolate are better! Who knew? Candied orange peel. Sounds like a winner to me. Begging to be added to my variations of shrimp (especially coconut shrimp), sautéed peanuts, brown rice and butter, and some kind of glurp based on marmalade/vinegar. Hmmm. But what will I have for dessert? Bwahaha! Thank you, Manu. Yes, when I'm in the mood for chocolate I love the combination of chocolate and orange! Sully, those sound like some very good uses for candied orange peel (I'm wowed! ), especially the glurp -- I do love a good glurp! Thanks so much, Dawn! I hope you'll try it soon. It's kind of fun to make! Although I've never made candied orange peel I am well aware of the appeal and the best part is using the whole orange, one way or another. Your hubby is right, the photo looks like french fries lol but a much healthier and sweeter variety. Thank you, Judith. Yes, I didn't mention it in the post, but that is one of my favorite things about it is being able to make use of the whole orange. Jean, your candied orange peel looks delicious and so pretty too. All the uses for it makes it a good idea to make the effort. All I can say is, "Yum!" Homemade makes all the difference. The store bought ones usually are too sweet for me. Sandi, thank you. It's really not much work. It *sounds* like it is when it's written all out, but it isn't! Thanks, Angie. I don't trust that the store-bought ones are free of dyes and other chemicals, so I'd rather make my own. Katarzyna, thanks. I hope you'll try it soon! Boy! 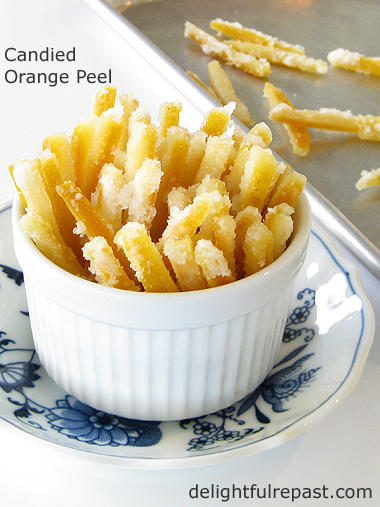 That would be a shock if you thought you were tossing a French fry in your mouth and instead it's candied orange peel. Hopefully, he didn't dunk it first in ketchup. I'm going to start saving my orange peels and I'll be on the lookout for Meyer lemons . Have a great weekend. I have to make this, Jean. I just have to. It looks fabulous and would be so wonderful both to use in cooking or as a snack. AND I have the oranges on hand today! This is the best. And might even end up being Christmas gifts! I've never made anything like this but I super love oranges so think I'll give it a try! Pinning for later, thanks for sharing! Visiting from Miz Helen's Full Plate Thursday! Jeanie, thank you so much! Do let me know how it turns out for you. Wishing you a delightful December! Thanks, Erica. Isn't Miz Helen's party fun! Hope you'll try this soon. At first glance, I also thought they were french fries. HA! 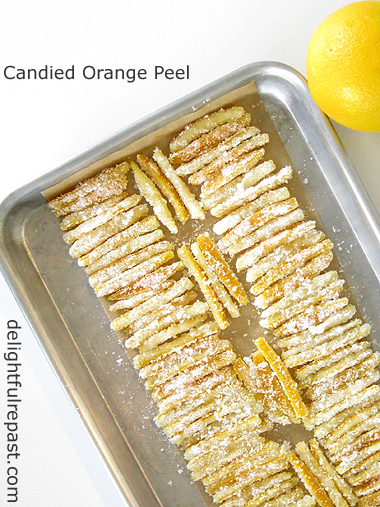 I've never had candied orange peel but would love to try some dipped in chocolate! I love all these old fashioned things like candied orange peel. We are so spoiled today and you have helping to keep tradition alive and well! Thanks for sharing and linking. Looks delicious - and pretty, too! Thanks, Margie. Yes, dipped in chocolate, not ketchup! Bernideen, thank you so much for noticing my "theme" of traditional foods. Thanks, Patti! I just had a piece as I walked by to check on my bread dough. Quite a treat! 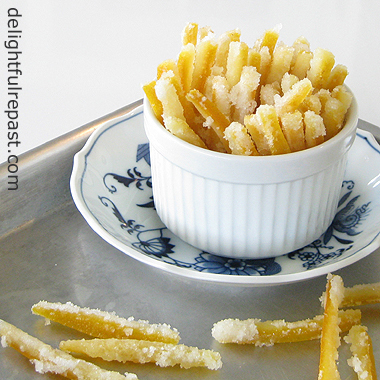 Wow Jean, I'm with your hubby in thinking that the candied orange peel do look like French fries! I wish I could taste one right now with my cuppa tea. Happy baking, Jean! Thanks, Kitty! My "fries" are about to be chopped up and put into some cookies! Thanks, Keith! Be sure to make a batch soon because I'll soon be posting a cookie recipe that calls for it. Have a delightful December! I will have to try your recipe, Jean - I just depleted my stash when making panforte! Have a wonderful Christmas! David, I think you'll have fun with it! I just chopped some up today and put it in cookies. I've never tried panforte, but I'm sure I'd like it. Have a delightful December! This Candied Orange Peel would be perfect to decorate and to be enjoyed with the Christmas Cakes I've shared in my last post, especially with the Pampapato from Ferrara ( Emilia Romagna, where I have some roots of mine ) and even if it's not much known in the USA, I'm sure you've heard of it and you know that candied peel of orange, lemon and clementine are amongst their ingredients, your culture in food is utmost, my Dearest ! I hope to find the time to prepare this lovely recipe of yours to garnish my Pampapato - which is ready for some weeks - for Christmas Day, on our table it would be much more beautiful than ever, for sure ! Dany dear, thank you. This is something I must make one day because it would be difficult for me to find here locally, though I could probably order one through the mail. I like all the ingredients, so I'm sure I would like the final cake. Some people cover them with chocolate, which would be beautifully accented by a garnish of candied orange peel. Have a delightful December and a wondrous winter! Marilyn, thanks so much! Pins and Yums are so appreciated, too! Yum. I like to slice them thin and put them in cookies, they really add a certain something. Thanks, Amalia. That's just what I did over the weekend, and I'll be posting the cookies in a couple weeks. I like the peel in scones, too. Need to make more peel! They look like divine French fries, Jean! Love your homemade candied peel. Thank you so much for sharing this recipe with us at Hearth and Soul. I'll be featuring it at the party this week! April, thank you so much! And in a couple weeks I'll post the cookies I put the peel in. I love Candied Orange Peel and haven't made it in years, you have inspired me to make it again. Wishing you and your family a very Merry Christmas and thanks so much for sharing with us at Full Plate Thursday! Thank you, Miz Helen! Isn't it funny how we just stop making something we like; I guess it's because we have soooo many things to make! I hope you and your family are having a delightful December! :D Why didn't I think of that? Thanks, Greg. Peace and joy! It's been a while since I've done candied orange peel Jean, and your photos have inspired me to give it a try again soon! They really add that special touch to baked goods! Doreen, I'm glad to hear it! I do that, too -- really like something, but then not make it in a long time. Thanks, Brooks! Yes, this would be perfect for the panettone. I have a feeling that pan is in your near future! All the best to you and yours. Thanks, RWW! I think you're going to love it! You mentioned a ton of great ways to use them and I love the idea of using them as a garnish or part of a fondue with chocolate of course! 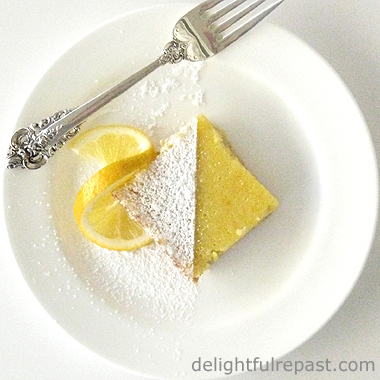 Love this recipe Jean! Julie, thank you so much! You are going to love them with chocolate! I hope you'll try it soon. This doesn't sound like too much work and what a tasty treat it would be! Chocolate coating, like you suggest as an option, also sounds interesting. I guess you'd just melt chocolate and dip it in without the sugar coating. Thanks, Richard. I think you'd have fun with this. And I'd go ahead and do the dredging in sugar, but use the finer baker's sugar, and then dip in bittersweet chocolate. We love these special treats! Thanks so much for sharing your awesome recipe with us at Full Plate Thursday! Hope you are having a wonderful week and hope to see you soon! Thank you, Miz Helen! I'll be back! Nikki, you're never going to want to be without it! Mr D DID have a surprise, I'm just glad he didn't dip it in ketchup!